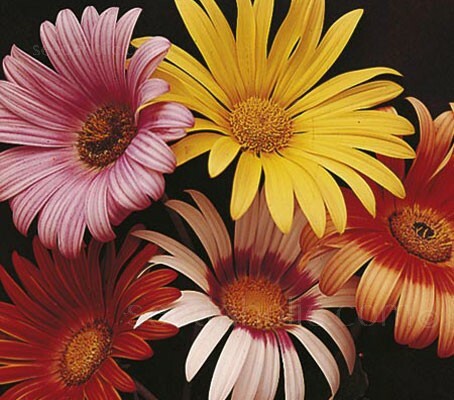 Arctotis was born to play a starring role. They are among the most brilliant of all daisy flowers. 'Harlequin' is a beautiful strain with large, brilliantly coloured flowers ranging from cream, yellow, orange, red, crimson and purple, with many different combinations, some with contrasting tones and with a luminescent sheen. 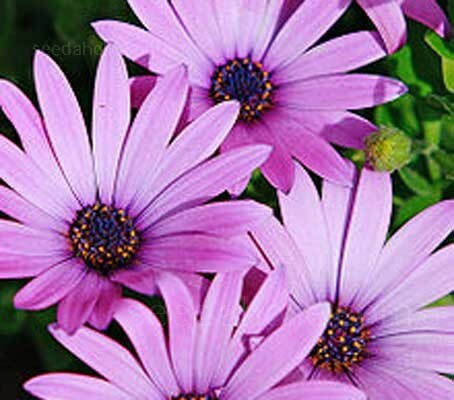 In its native South Africa, the African daisy bursts into bloom when the spring rains come, although in gardens plants bloom copiously all summer. A tender perennial, it is grown most commonly as an annual. Like many of the plants in the daisy family from South Africa, it's tough enough to live in hot, dry conditions, but a modicum of moisture will bring out stellar blooms. The flowers are light-sensitive, so always look outwards into the garden. In dull weather and late in the day, they will close, but open again at a touch of sunshine and warmth. They are essentially plants for the sun, in well-drained light soil and sand. Flowering for a period of ten weeks or more, with our increasingly warm and bright autumns, they perform long and hard until first frosts. The flowers are held well above the plant, which forms a compact mound. The leaves are handsome greyish-green that combines well with other colours in the garden. The plant will tolerate lots of abuse. Plant Arctotis in beds or borders where full sun is available. They will tolerate growing in dry rock gardens for early season bloom, they will also bloom indoors in cool sunrooms or greenhouses.. With richer soil and moderate moisture, there are larger flowers and lusher foliage. Easily raised from seed, Arctotis deserve a prominent position and make ideal subjects for containers and for cut flowers. Not enough of us grow arctotis. You'd be hard-pushed to find better performing plants. At Sissinghurst, Arctotis are planted en masse. This is how they look best, not in ones and twos, but in drifts of twenty or thirty. Harold Nicolson, who created the garden with Vita Sackville-West, had bought two plants at an RHS show in 1959. He brought them back to Sissinghurst, propagated them and soon had enough for the bold sweep on either side of the South Cottage front door. They follow crimson and orange wallflowers, Erysimum cheiri 'Blood Red' and 'Fire King', in early summer - an excellent succession pairing - and look good, flowering hard in full sun until the late autumn. They've been planted in this same spot every year since then, and are still there nearly 50 years on. Sowing: Sow February to April, for flowers July to October. Seeds can be sown directly where they are to grow, but better results are gained from sowing early indoors and transplanting outdoors once soil has warmed. Sow indoors under glass during early spring in a good seed compost. Just cover the seed with compost, or vermiculite and gently firm down, Sealing in a polythene bag after sowing is helpful. Germination usually takes 21 to 35 days at 16 to 21°C (60 to 70°F). When seedlings are large enough to handle, transplant and grow on in cooler conditions. Gradually acclimatise to outdoor conditions for 10 to 15 days before planting out after all risk of frost, 30cm (12in) apart in a sunny spot on light well drained soil. Arctotis must be planted in situations sheltered from frost; sunny sloping banks, rock gardens and elevated areas suiting them to perfection. Fertilise only lightly, give them a seaweed feed occasionally, water in the heat of summer and dead-head them as often as you can, and they will happily keep performing until the late autumn. Easily raised from seed sown under glass or from cuttings taken in autumn. Rooted pieces may be replanted when dividing old clumps. In warmer areas and frost free zones where the plant is perennial, they are best lifted and replanted every two years. Flower Borders and Beds, Container Gardening, Cut Flowers. 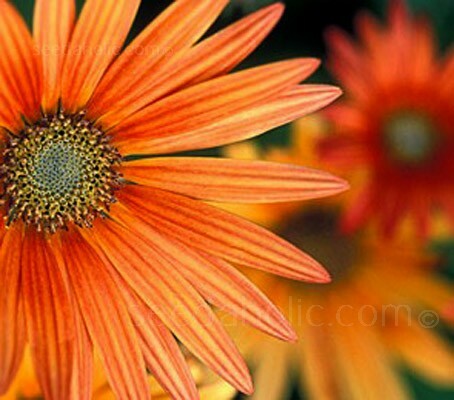 Arctotis is a genus of about forty to fifty species of flowering plants in the family Asteraceae, native to southern Africa, from South Africa north to Angola. Some of the plants are alternatively placed in the genus Venidium. Some distinct species occasionally grown for groundcovers include the orange-red A. calendulaceae decurrens, with silvery grey leaves.A. leiocarpa, the karoo daisy, is a fine form with pure white flowers. Some species have been developed as popular horticultural items because of their attractive brightly coloured flowers. Gardeners throughout the world cultivate both species and hybrids as half-hardy annuals. The genus name Arctotis is taken from the Greek arktos meaning 'bear' and otis meaning 'ear' referring to the pappus scales. 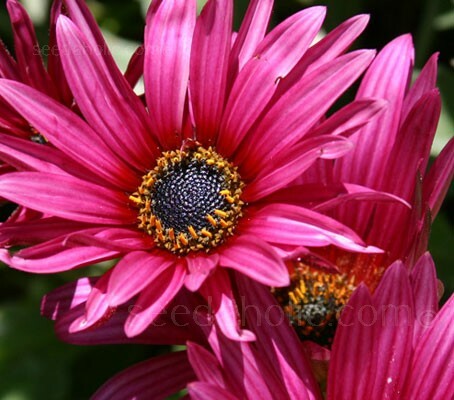 Many species of Arctotis are called by the common name "African daisy", or "Gousblom" in Afrikaans. Various species have been crossed to produce the modern hybrids - open flowered, large hybrids on tall, strong stems. The species mainly used are A. acaulis and A. squarrosa. with many different combinations and tones. Sow February to April, for flowers July to October. 21 to 35 days at 16 to 21°C (60 to 70°F).